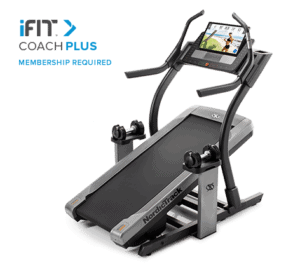 NordicTrack x11i Incline Trainer – Read full review here. Low Impact: You are typically walking on these machines which means there is less impact to your joints and your lower back in comparison to running. Burn More Calories with a Steep Incline: If you have walked up a steep mountain or hill you experienced a heart pounding cardio workout. This is what you get on an incline trainer. Exercising at a steep incline can burn more calories in less time. These machines incline at an intense 40%. Now the company claims that you can get 5x the workout and that is an over statement, but there is no question that at 40% your heart rate will soar. In fact, most users will only be able to workout at that steep of an incline for a short duration. Target More Leg Muscles with Decline: With both the x11i and the x22i you can also decline the deck up to 6%. This allows you to simulate going up and down mountains and hills, and lets you target different lower body muscles. If you have ever hiked a mountain you have experienced the strain on different muscles going up and down. 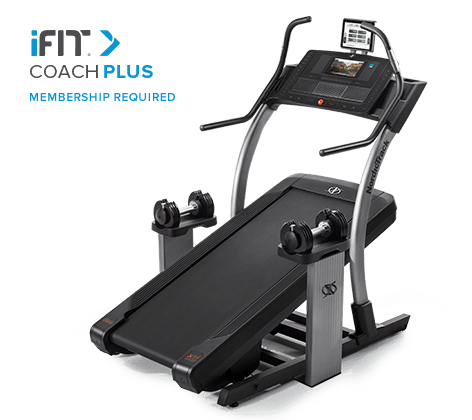 MID-WEEK SALE ENDS THURSDAY: The NordicTrack X22i Incline Trainer comes with FREE Shipping and 1-year FREE iFit Membership. Financing is available. MID-WEEK SALE ENDS THURSDAY: The NordicTrack X11i Incline Trainer comes with FREE Shipping. Financing is available. 22” x 60” walking surface – The x11i and the x22i has a walking surface that gives you extra space where you don’t feel confined like many smaller surfaces you find on treadmills. The deck will accommodate your wide strides without feeling like you are about to walk off the back end. And the extra 2” width gives you more comfort and less chances of stepping off the side. 25 Continuous Duty Motor – The motor is commercial grade and is designed to handle any abuse you want to dish out. Steep inclines, high speeds, multiple users, and heavy users is no problem for this motor. These motors seldom have any service issues, that is why they come with a lifetime guarantee. Full Color Touch Screen Displays – Both the x11i and the x22i come with full color touch screen displays. The size of the displays varies depending on the model. These displays allow you to also access the Internet so you can view your favorite sites as you are working out. NordicTrack x9i Incline Trainer – Read full review here. Commercial Grade Heavy – Both the X11i and the x22i are extremely heavy. They don’t provide the actual weight on the stats, but having been on these machines, you’ll find that these machines are rock solid. In fact, it is highly recommended that you get the inside delivery service, because the standard service is to the curb, and you’ll need the Green Bay Packers front line to help you move it inside. Generous Warranty – The warranty includes lifetime frame, motor, and deck, 6-Year parts and electronics, and a 3-year labor, which is overall generous coverage. Read about why the warranty matters. Customized Workouts – The ability to create daily customized workouts based on your fitness goals. These workouts can be progressive and increase with intensity as you improve. Includes an iFit wearable for on-the-go tracking that can be used on and off the incline trainer. This allows you to track all your physical activity throughout the day. Gives you access to an extensive library of virtual workouts that you can view on the full color display. For example, you can walk the beaches of Hawaii, or hike the mountains of Switzerland, and in the process you get audio coaching. 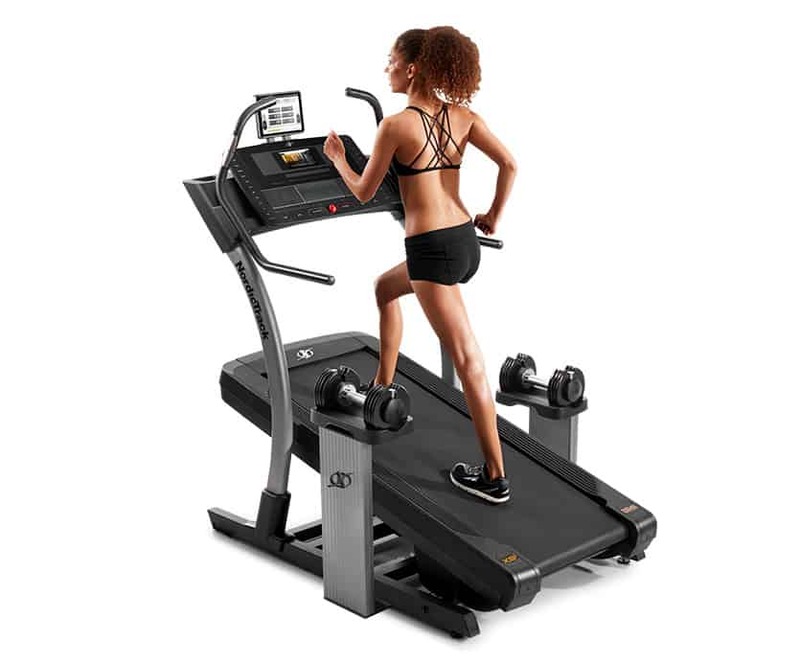 What makes iFit virtual training so impressive is that your incline trainer will mimic the terrain of the video. The NordicTrack x11i vs. x22i – Which is Better? 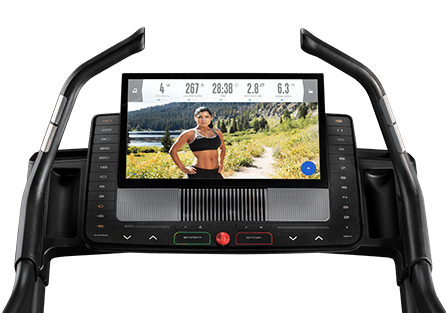 NordicTrack x22i Incline Trainer Console – For $700 more over the x11i, the main advantage is this large 22″ console display. So you have done your research and you’ve decided that the incline trainer is your cardio machine of choice, but which one should you choose? If you are like most people you have narrowed down your choice to the NordicTrack x11i vs x22i because of the extended warranty, bigger motor and larger touch screen display. Now typically the NordicTrack X11i cost $2,199 with free shipping and the NordicTrack X22i is $2,899 with free shipping (Remember to upgrade to inside shipping). So exactly what do you get for the extra $700 on the x22i? Actually, not a whole lot. If you check out the specs the only real difference is a 22” display on the x22i in comparison to a 10” display found on the x11i. Unless you are obsessed with a larger display the extra $700 does not justify the cost. You can use that $700 to purchase a large HD flatscreen TV. My recommendation is go with the NordicTrack x11i, it is the best value of all three of the incline trainers.